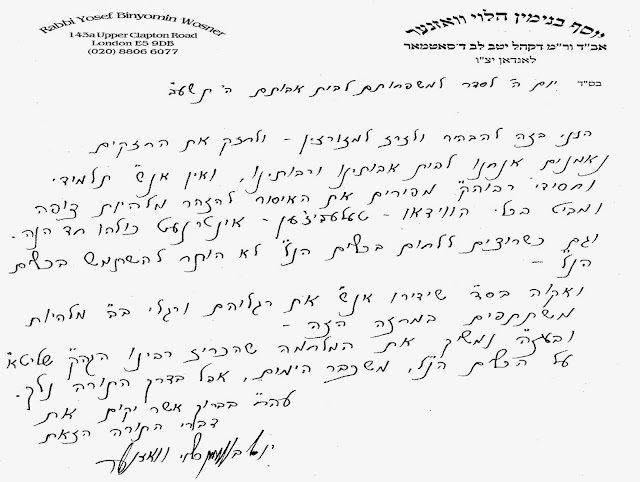 The above is a letter in the Holy Tongue (ancient Hebrew) written by Rabbi Yosef Binyomin HaLevi Wosner, the spiritual leader of the Satmar Kehilla of Clapton, East London, in which he supports and encourages those who have taken up the fight against the internet web related deluge of immorality that has spilled into the Ultra-Orthodox Jewish community and taken them by surprise, causing the multitudes to temporarily abandon their life of holiness and purity. We had the Karaites, the Saducees, the Hellenists, the Reformists, Reconstructionists, the Conservative, the Liberals, the Zionists, the Mizrachi and now there is The New Jew. Refrum is the destination for every Jewish person who has decided to start living like a Jew. With the invention of the world wide web and its associated Digital Revolution, there are many aspects of our lives as members of society that needs re-thinking of Halacha. The internet and its enabling technologies have forced upon us a new reality, which behooves us to re-evaluate our attitude towards the outside world and its influences - for the good and for the bad. The fact that technologies like eMail, web and TxT may be put to good use to facilitate many logistic-intensive changes should help us achieve the new life rules that are required in this day and age.